The Knesset plenum held a debate on the bill proposed by MK Ahmed Tibi (Joint Arab List) to hold an official memorial day in Israel for the Nakba (catastrophe), a day that mourns tha fact that the Arab nations failed in their atempt to destroy the nascent Jewish State in 1948. 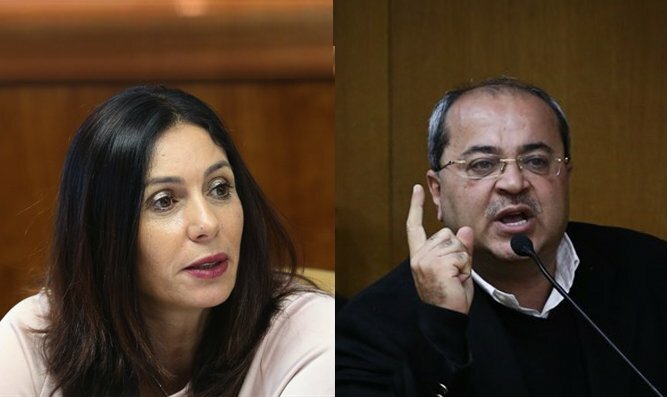 Culture Minister Miri Regev, who spoke in response to the bill on behalf of the government, slammed the Arab Knesset members and accused them of hypocrisy. She claimed that they would not want to live in an Arab state despite their attempts to demonize the Jewish State. According to her, MK Tibi should have proposed a bill called "Bracha" (blessing) in the State of Israel because Israeli Arabs live in a "Garden of Eden" compared to the rest of the Middle East. Tibi continued the altercation, saying:"I suggest that those who came here only in recent decades not talk about themselves as natives. There is a definition of natives in international law, and all the people on the Joint List are proud natives. We did not come here by ship and plane," said Tibi, ignoring the historical fact that a large proportion of Arabs who call themselves Palestinian came to Israel to find jobs when the early Zionists began developing the land and alluding to Jewish immigration. "We are the salt of the earth," he ended.